SHENZHEN, China, Sept. 20, 2018 /PRNewswire/ -- Makeblock, the world leading STEAM education solution provider, announces that its Neuron Explorer Kit is boarding Apple Swift Playgrounds to help students unleash their creativity and thrive in the age of technology. Swift Playgrounds is a revolutionary app for iPad that makes learning Swift interactive and fun. When combined with Makeblock's Neuron Explorer Kit, it serves as a perfect starting tool for students with no coding knowledge. Makeblock designed an immersive 4-section learning program, the Neuron Playgrounds, to make Swift coding easy and fun with the Neuron Explorer. Students will learn how the concepts of coding and engineering unfold in the physical world through hands-on projects with the Neuron Explorer Kit. 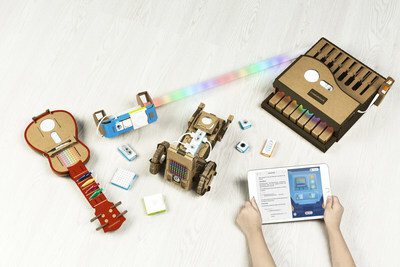 The Neuron Explorer Kit is exclusively designed for and available for purchase at Apple.com and select Apple stores around the world and features four supplementary cases for users to build creations from precise laser-cut cardboard. Users can bring the creations to life with the 12 programmable Neuron blocks and Swift coding. Included creations are the Explorer car, Piano, Ukulele and a LED Sword. More than 30 lessons combining physical building techniques with digital learning through Neuron's flow-based programing are available now in Apple's Swift Playgrounds for the iPad . Once the Neuron Explorer is connected to Swift Playgrounds through Bluetooth, users have access to engaging on-screen experiences. Coding a movement for the Explorer will cause its motors to roar on the iPad screen as well as in real life once the program is run. It not only gives users an unlimited coding experience but also serves as a visual expression of what the Swift code should be doing and how to control Neuron with the user's own code. "Since day one, Makeblock has been dedicated to helping people turn their ideas into reality and letting creation be a way of life. At Makeblock, we believe our future is driven not only by technology but also through creativity," explained Jasen Wang, Founder and CEO of Makeblock. "Makeblock Neuron is designed to unleash students' creative potential and teach them how to use technology to solve problems. As a result, Swift Playgrounds is an ideal place for Makeblock to inspire creativity and at the same time encourage more students to become problem solvers." Makeblock Neuron has received 8 international awards/certifications: the Edison Gold Award, IDEA Gold Award, 2018 CES Design Award, Finland Kokoa Education Standard Certification, German iF Product Design Award, German Red Dot Award, Japan's Good Design Award, and Korea's K-Design Award. Creative journeys with the Neuron Explorer Kit can begin by downloading Swift Playgrounds at Apple App Store and subscribing the Neuron Playgrounds. Or download Neuron App to experience IoT on Makeblock's own flow-based coding platform. Swift is a robust and intuitive programming language created by Apple for building apps for iOS, Mac, Apple TV, and Apple Watch. Swift Playgrounds is a revolutionary app for iPad that makes learning Swift interactive and fun. It requires no coding knowledge, so it's perfect for students just starting out.